Saving up money can be difficult. You tell yourself that going to dinner with your friend is fine—you’ll just get something cheap. But then you look at your bank account and see that all of those little things add up. If you’re someone who struggles with this problem, the good news is that there are now a bunch of money tracking apps to help with personal finances. This is an incredible app for people who dislike using charts and graphs when outlining their budget. The unique aspect of this app is that you interact through a chat feature—talking to Penny herself, she’ll tell you what you would have had to discern from any graphs and charts. A mobile financial app, Clarity Money has an easy-to-navigate design. It gives you highlights of recent account activity and allows you to track and cancel different subscriptions. The app will also notify you if your monthly spending is more than what your expected monthly income is. 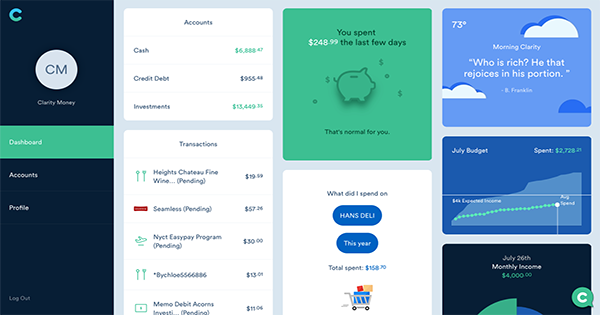 Wally gives you control your money—it helps users determine where their money goes while also aiding in the process of balancing income and expenses. Along with the 360 views of your financial health, it also has a location tracking device which helps makes tracking expenses easier. This is an awesome app for millennials figuring out how to keep track of expenses. One of the most popular apps for keeping track of expenses, Mint is one of the oldest expense tracker options out there. Mint supports a wide range of banks and lenders so you can start getting smart with your money. Not only can you connect to your bank and card accounts, but you can input your monthly bills—with Mint, all of your finances are in one place. YNAB stands for You Need A Budget, and that’s exactly what this app helps you create. Their main rule is that every dollar needs to have a job—you need to be intentional about your spending. This app takes more of the traditional approach to budgeting, but it’s great for people who want to be serious about saving their money. Acorns is a remarkable app that makes saving a painless process. Every time you make a purchase with a card, Acorns rounds it up to the next highest dollar, and will then save and invest that money for you. Many users claim that they’ve never even noticed the money put away! This apps takes a different route to keep track of expenses than others. Joy focuses on the user’s happiness as it relates to purchases. The app asks users to rate their purchases as happy or sad and then shows how money relates to satisfaction. An app for non-serious investors, or for people who want to save money without thinking about it too much. Digit evaluates your spending habits, and every two or three days the app transfers a non-essential amount of money from your income to a savings account—an amount that you won’t notice. This app is capable of generating small savings for users that won’t disrupt their normal lifestyle.